As the title suggests, a book based on the absence of colour and a focus on black, white and shades of grey captured through an array of media. Starting in the fifteenth century, the book travels to the present day, spotlighting the artists that grind their alchemy through a lens that is dominated by the duality of yin and yang. It is interesting how monochrome art was perceived through the ages, be it as religious asceticism, i.e. helping to focus on what matters instead of being distracted by flashy colours, the indulgence in grey scales, i.e. grisaille to invoke the impression of three dimensionality, and especially the creative process that serves as the foundation for the creation of colour paintings yet is more often than not rooted in black and white sketches. Different art periods are shed light on in terms of monochrome stand out artworks from the photorealistic to the abstract and it is astonishing to see the artistic prowess some creators display while limiting themselves to a monochrome palette and thereby exhibiting details through a heightened sense of dramatic impact that would otherwise have gone unnoticed. 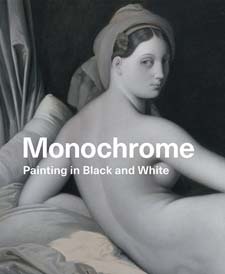 The accomplishment of the ambitious Monochrome: Painting in Black and White lies in the reader gaining a perspective and appreciation for colorless art – art that does not have to be dreary – and one that is central to modernist experimentation and manipulation of perception, light and space. Having read the book, the absence of colour in art immediately creates curiosity as to the motivation behind artists deliberately abandoning the hues they have at disposal.